These medicinal herbs are low-growing plants that you can find growing almost anywhere. The Native Americans used plantains to heal wounds, cure fever, and to draw out toxins from stings and bites, including snakebites. You can use either one for healing purposes, depending on the availability in your locality, but most herbalists seem to prefer the broadleaf plantain with larger, but softer, edible leaves. Plantains have really strong antimicrobial properties and have anti-inflammatory and analgesic properties too. Plantains also have an astringent property that has a cleansing effect on the whole body. It helps dry up excess secretions in the respiratory tract and the digestive system, and it is also useful in treating colds and diarrhea. The edible leaves of broadleaf plantain contain high amounts of calcium and other minerals and vitamins, including Vitamin K. This vitamin helps stem bleeding from cuts and wounds. Burns – Apply a poultice immediately and apply a bandage with leaves. Cuts and open sores – Stop bleeding from fresh cuts by applying crushed plantain leaves. Wash with plantain tea or diluted tincture (1 tbsp to a glass of water) to prevent infections make the healing process faster. Boils and acne – Touch with a drop of tincture or apply salve. For mouth ulcers – Swish 2-3 Tbsp plantain tea in the mouth 3-4 times a day. For throat pain/infection – Gargle with plantain tea or diluted tincture. Take 5-10 drops of tincture under the tongue and ingest it slowly. Dandruff and other scalp problems – Apply plantain tea or oil infusion to the scalp and wash off after an hour. For poison ivy/sumac/oak – Apply a poultice immediately, and then wash the area with plantain tea. Apply plantain sludge (more details at the end of this article) until the stinging pain is gone. 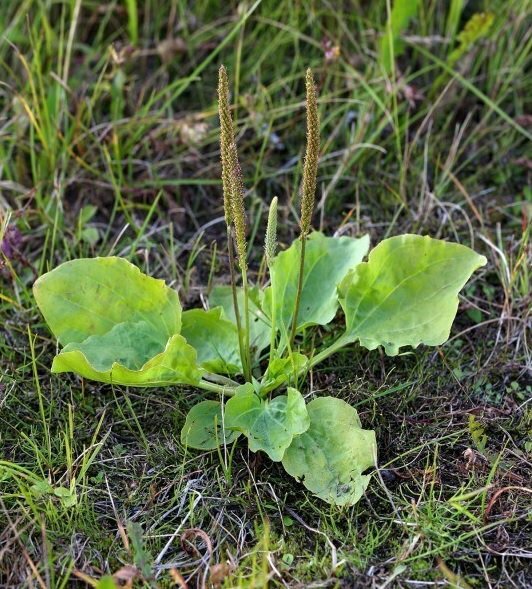 For sunburn – Apply fresh poultice or plantain sludge liberally. Wash with tea and apply salve. For relief from gastrointestinal inflammation – Take the tincture under the tongue or drink plantain tea. This is one of the quickest, and most effective, way to use this healing herb. In case of an insect bite, bee sting, or poison ivy exposure, get a few leaves, crush them, or pound them with a stone, and apply directly on the skin. If you are using it on yourself, just chew the leaves. First wash the plantain leaves well and keep it in a bowl with lid. Boil the water and pour over the leaves in the bowl,then cover with the lid and let them steep until the bowl is cold to touch. Strain out the tea and store in the refrigerator for up to 2 weeks. Drink one-two cups of this plantain tea a day to control diarrhea or to get relief from the symptoms of cold and fever. You can drink it plain or add honey for taste. It can bring relief to people who have stomach ulcers, IBS or other inflammatory diseases of the gastrointestinal tract. Place the leaves into a jar and put the alcohol in it so that it will cover the leaves completely and it will fill the jar. Use a glass rod to stir the mixture good. Put the lid on and place the jar in a dark place, don’t forget to shake it every few days. After six-eight weeks, decant into clean bottles and store in a dark place.